I’d like to welcome my good friend, Carolyn, as a contributor to my series, A Postcard From…Awesome Places Around The World! This year is going to be all about one of my favourite things – travel! If you’d like to share your area of the world, please contact me. 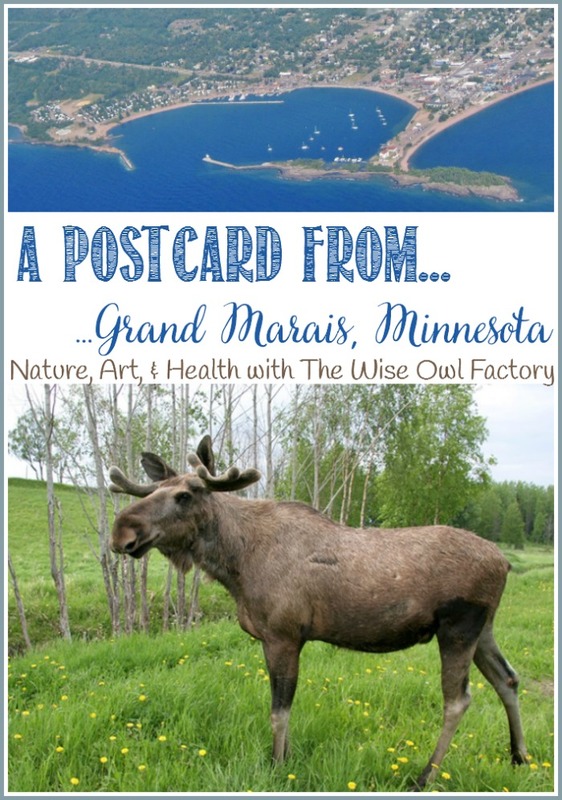 Today’s postcard is from Carolyn of The Wise Owl Factory coming to you from …Grand Marais, Minnesota! Click through the links and you’ll find out more information about Minnesota, as well as some great free printables! 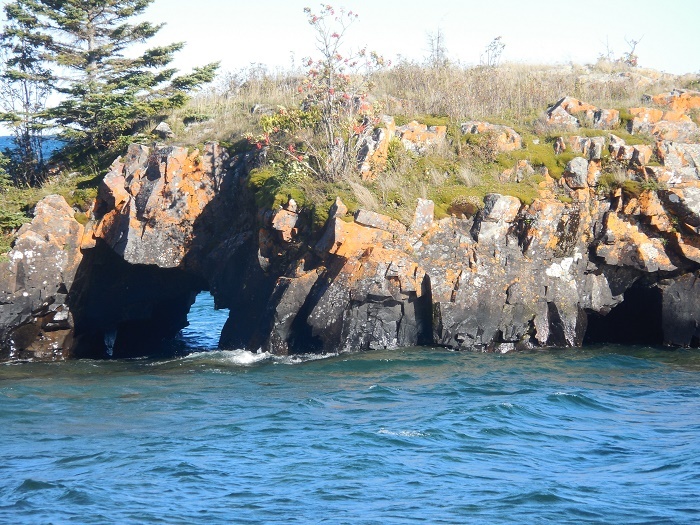 Grand Marais, Minnesota, is situated on the edge of the Superior National Forest at the foothills of the Sawtooth Mountains. The most photographed natural feature is of the harbor area. 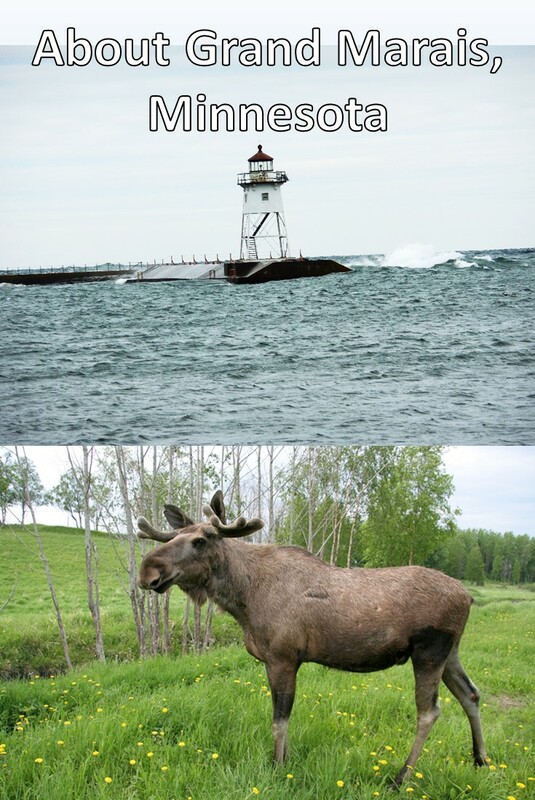 This town is not to be confused on by the same name in Michigan which is also on Lake Superior. 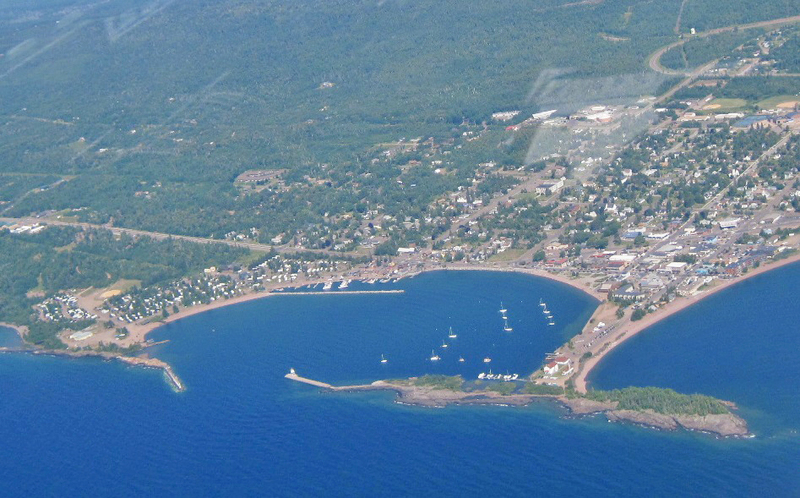 An aerial view when flying reveals how the town of 1300 surrounds the harbor. There are nice restaurants and shopping as you might expect. In town, the main harbor area is calm and has a boat landing area for seaworthy vessels. Artist’s Point is a popular place for hiking, geocaching, and painting. Sailboats anchor over the summer season before ice forms in the fall or winter. On the East Bay, you will find rougher waves as the water is more open than around the harbor. 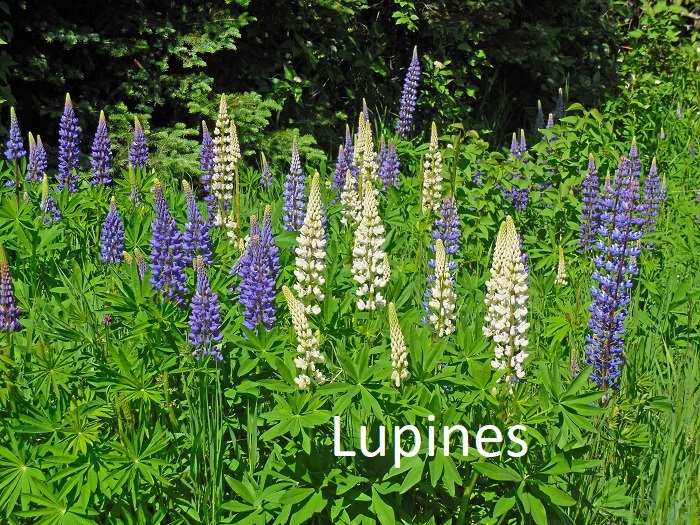 At the end of June and during July, lupines are frequently photographed. Expect a car to suddenly pull over, a tourist get out of the car, and snap photos of these beautiful wild flowers. Pinks, purples, and whites in several shades are delightful. These cannot be cultivated and established just where a gardener might want as they are truly wild. They are beautiful and also—surprise — an invasive, non-native species. Although a visitor might think there are beaches a plenty along the north shore, this is not usually true. Rocks and cold water are easy to find. 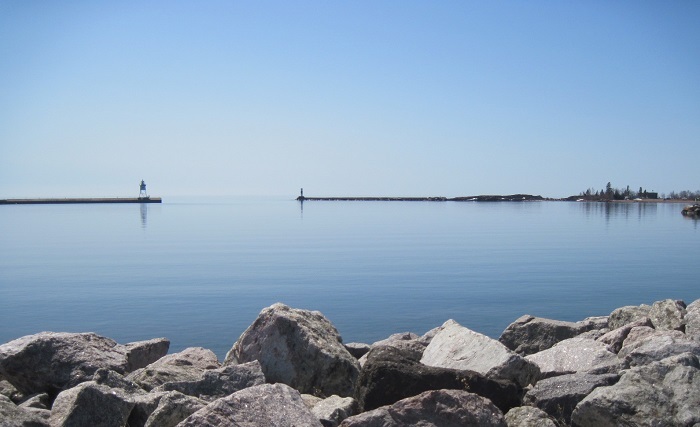 The annual year round temperature of Lake Superior is about 39 degrees Fahrenheit, or 4 degrees Celsius. School children are taught not to swim alone if at all, and what to do in case of hypothermia. There are few attractions especially for children in this small town. 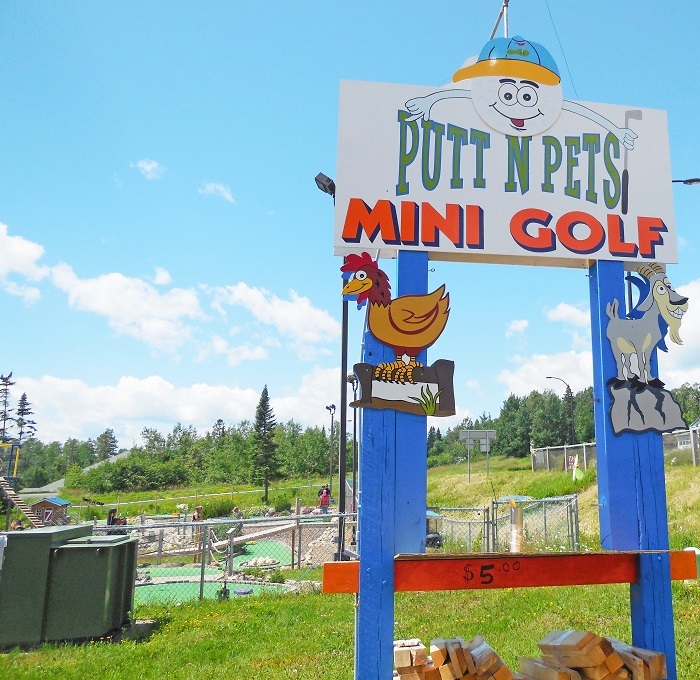 The one wonderful exception is the Putt ‘n Pets golf course with its many and assorted activities. There are animals, an 18 hole miniature golf course, and many photo opportunity stations. 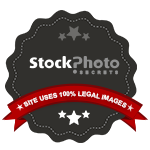 Gemstone mining has recently been added, also. At night the lights help the fun continue. Johnson Heritage Post is an art gallery in town which is part of the Cook County Historical Society. 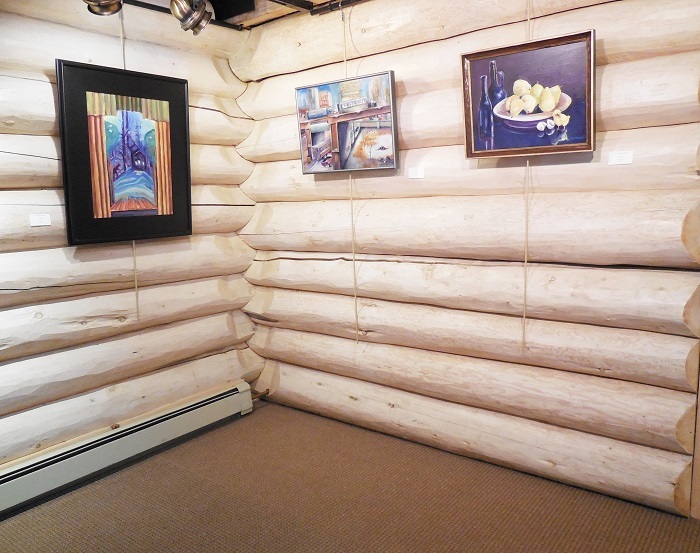 They have pioneer art as well as rotating exhibits hung on the log walls. Art openings and receptions are part of the activities held in this building. 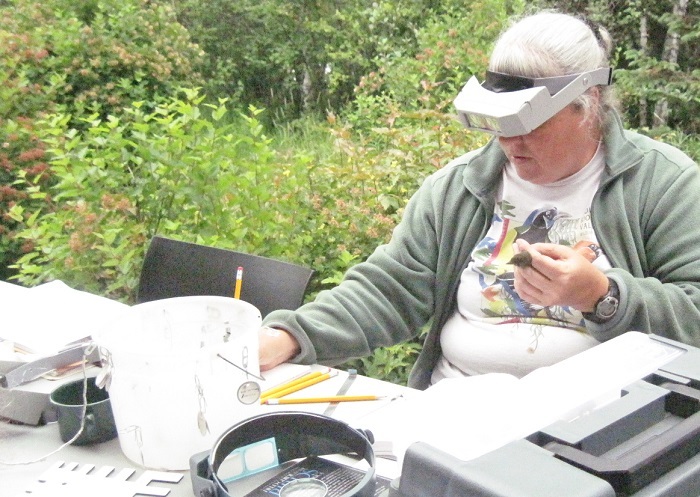 Sugarloaf Cove is about 45 minutes south of town, and bird banding continues all summer. 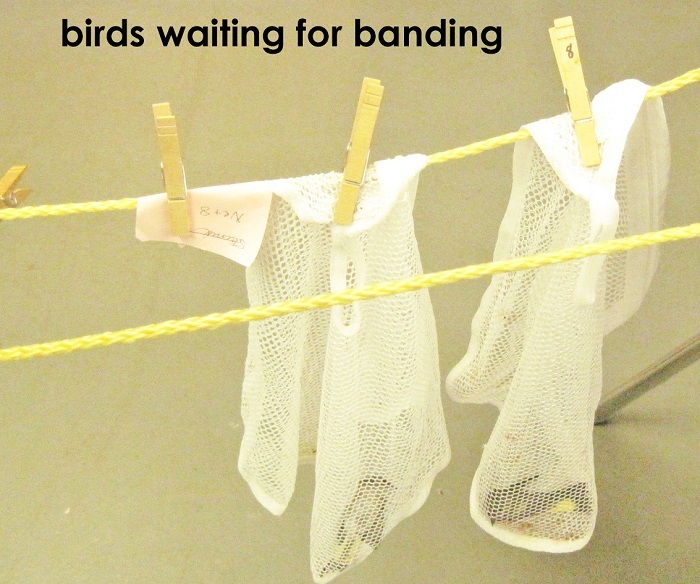 Birds are placed in bags of netting and clothes pinned to a rope while they wait their turn for bands to be checked or added. These are tiny, tiny bands as you might imagine. Bird being banded at Sugarloaf Cove by a dedicated naturalist. Druy Lane bookstore is a delight for children and adults alike. The World’s Best Doughnut shop is in Grand Marais, too, if perhaps you have had to put up with less than the world’s best to date. The Java Moose Coffee shop, like many restaurants and business, is right on the harbor to best enjoy your coffee. 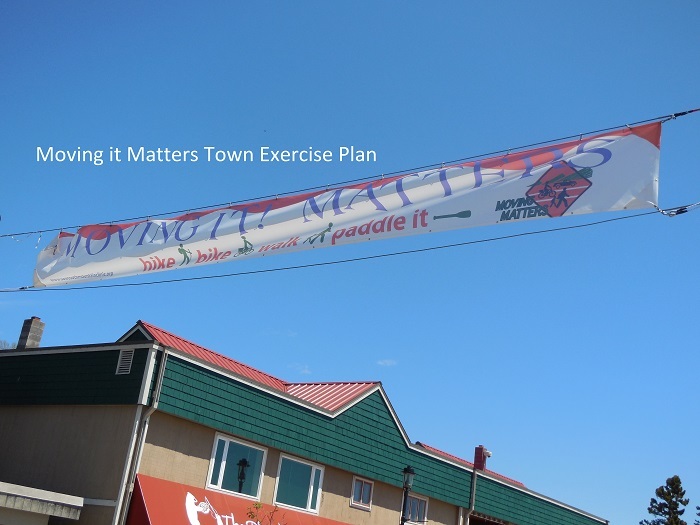 The town has an exercise plan for everyone and people record miles run, swum, walked, or biked on a website. Teams compete against each other, as well as individuals can just work for improvement. 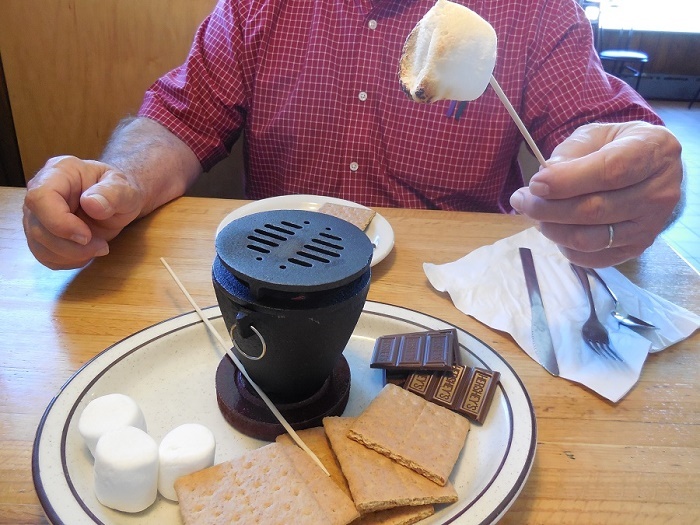 There are many opportunities to camp, but in the case of rain the Blue Water provides an alternative way to enjoy your S’mores, indoors! 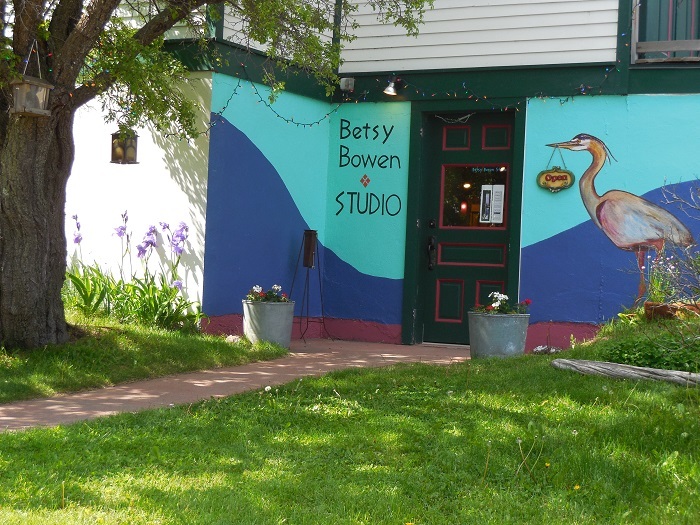 Finally, the best children’s books as well as gifts created by local artists may be found at the Betsy Bowen Studio where you can see the printing press she uses to create art for children’s books she illustrates and or writes. I hope you can visit someday! 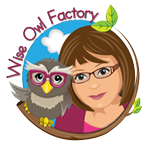 Carolyn Wilhelm is the author of The Wise Owl Factory site and blog. She has an MS in Gifted Education, a MA in Curriculum and Instruction K-12, and has finished the KHT Montessori 12 month program. 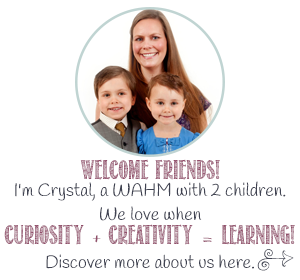 She makes mostly free resources for teachers and parents. 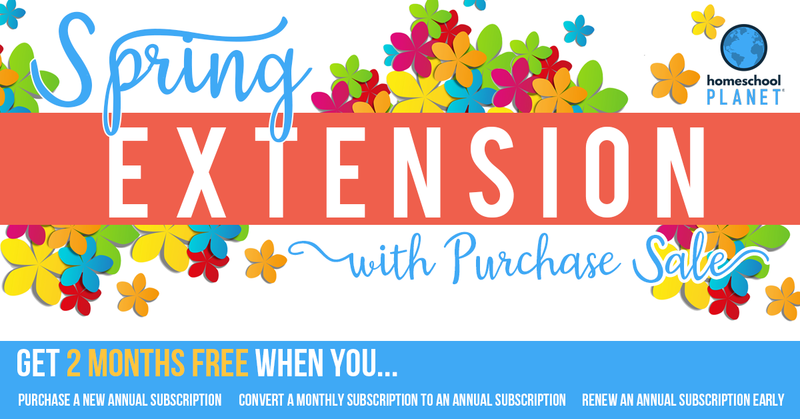 « Homeschool Planet Is Still My Favourite Online Planner! Thank you very much for sharing this information! I love your travel series. Thank you for being a part of it! I love learning more about places I haven’t (yet) been!